In former times the cost of building and maintaining churches was laid on the local squires who, in turn, gained the right, as patrons, to appoint the priests. The Lowe family has been squires of Denby since the fifteenth century. 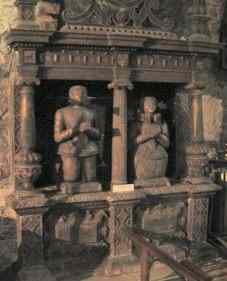 This monument in the north wall of the chancel commemorates Patrick Lowe, who died in 1616 and his wife Jane who died 22 years earlier in 1594. Behind their kneeling figures are figures of their four children. Two have their heads covered, indicating that they died before their parents. The monument is made of Derbyshire alabaster.